It took nearly half the season to get there, but Homeland is finally pulling all of its threads in one direction. 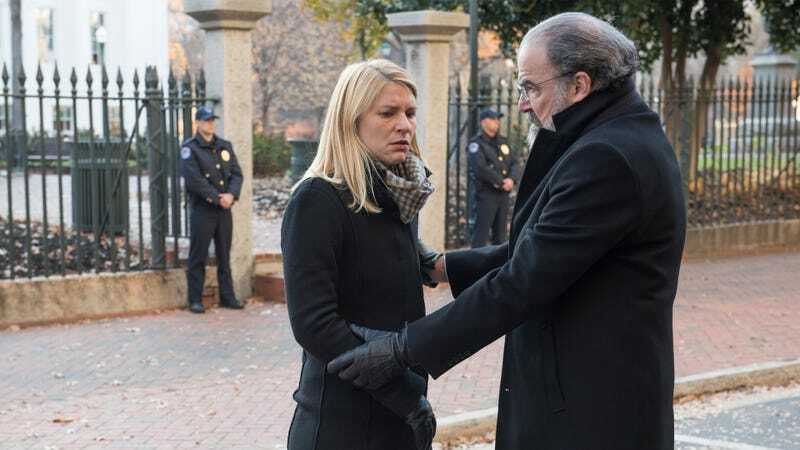 If you subscribe to the notion that it’s not really Homeland until Carrie and Saul have a scene together, rejoice! Tonight’s the night. Through all the changes over the years, Claire Danes and Mandy Patinkin have been at the heart of the show, even as the relationship between their characters deteriorates and regenerates. Does anyone really remember where we left off with these two last season? Do they even remember? Their scene this week is critical in that it re-centers Carrie in the narrative with the big reveal about Dante. The season started out choppy and then gained focus over the past couple of weeks, but Carrie’s missions still felt a little like a side project only tangentially related the emerging Russian storyline. It takes Saul, with his distance and expertise, to quickly suss out what’s really been going on right under Carrie’s nose. When she gives him the recap of the season so far, we realize that we never did see how things got started between Dante and Carrie in the first place. And while I’m sure some veteran viewers of the show have been suspicious of Dante from the start (somebody is always the mole, after all), Carrie doesn’t see it until Saul lays it out with his usual blunt, methodical precision. In some way or another, Dante is with the Russians. I’m not going to go back and watch the entire season again to make sure this twist works, but using existing Homeland story logic as a guide, it makes sense. Dante’s initial reluctance to get involved with Paley now looks like the beginning of a long con. His reappearance when Claire was adjusting to her new meds struck me as weird at the time, but looks like either a smart or lucky move now, as he was able to catch her with her defenses down. (I don’t know if Dante had any way of knowing Carrie had begun this med change, but maybe her shrink was in on it, too.) Both bugs failing last week certainly got Carrie’s attention, even if she didn’t connect that to Dante at the time. One thing Dante couldn’t have planned on was the surveillance Carrie and Max planted in Wellington’s home, and that’s where it all begins to fall apart. Still, even though he doesn’t know why Carrie is suspicious that Wellington is being set up, he has a plan in place to deal with it. It’s basic gaslighting, and this is likely one of the main reasons Dante picked Carrie in the first place. She’s already given him all the ammunition he needs by enlisting him to remind her to take her meds and keep his eye on her behavior and mood shifts. In a way, she’s the perfect patsy, and it’s that realization that hits her like a ton of bricks when Saul helps her see it. Saul is also putting together a special ops team of his own, recruiting an ex-CIA agent now exiled to academia and a top computer geek to help him establish a case for Yevgeny’s role in the Lucasville fake news and other disruptions. It turns out that it was Yevgeny himself who took the photos at the hospital a couple of weeks back. (The Americans’ Costa Ronin gets his proper introduction in the role this week with a wink-wink line about how “the Americans know I’m here.”) Saul gets an introduction to the concept of Russian bots spreading fake news memes, and it looks like the same source is responsible for both the Lucasville and a new story (complete with video) about Wellington getting rough with a government witness in a restaurant. That last bit is a set-up indicating that Simone Martin has also been in on it with Yevgeny since the beginning, and it’s her testimony before Senator Paley’s committee that now threatens the presidency. That Carrie now has to fight to save a presidency she doesn’t believe in is a juicy complication, but that’s the spy trade for you. She puts the team back together again for another mission, this time with Dante as the target. A tequila celebration provides the cover to slip Dante a Mickey, and Carrie turns on the charm, ensuring she’ll find her way into his home without having to break in. As she oversees the team’s search for incriminating evidence, it finally feels like she’s back at the center of things, in the eye of the storm. It took a while to get here, but here’s hoping “Species Jump” sets the stage for a thrilling second half of the season. Saul’s old pal Ivan doesn’t fare so well tonight. He doesn’t approve of Yevgeny’s methods, while Yevgeny sees his as a relic of an earlier, weaker Russia, and...well, that plays out about as you’d expect. Saul’s planned meeting with Ivan at a marina doesn’t materialize, and Saul finds the blood-stained buoy and necklace indicating Ivan’s violent demise. Keane’s attempted victory lap with the press over her handling of the Lucasville situation goes south when everyone gets the word at once that Wellington’s good friend Simone has struck an immunity deal. Why is Keane keeping him around again?